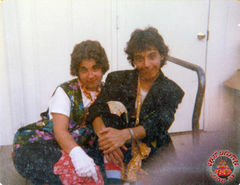 June Taylor as Red, and Joe ? 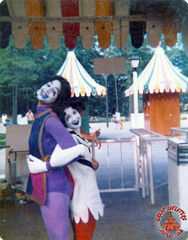 as a jester. Karen Cascarino on ? shoulders. 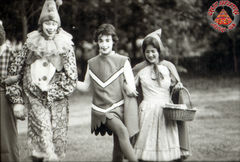 Penn Jilette, Karen Gersch, Michael Moschen. The clown in the middle is Prunes, embodied by Karen Gersch. 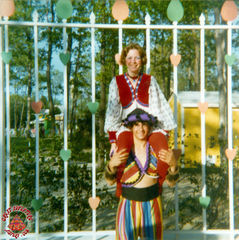 Yes, That's Penn and his then juggling partner, Michael Moschen, who is an awesome juggler in his own right. He manipulated crystal globes (although you only see David Bowie)in the Jim Henson movie LABYRINTH. 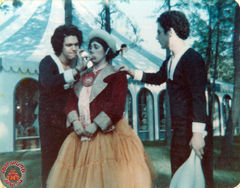 Hi, I'm Sharon and I worked at the park in 1974 as a street character and in 1975 as a puppeteer on the Pirate ship in Kiddieland. I have many fond memories of the time I spent there and the friends I made.